Race committees usually try to set their finish lines square to the wind direction, but windshifts and other factors often skew the line and favour one end. It�s not uncommon for this favoured end to be two or more boatlengths closer, and when you�re trying to gain every inch to beat your competition, this can make a huge difference. Theoretically, a good way to understand the orientation of any finish line is by visualizing �ladder rungs,� or imaginary lines drawn on the water perpendicular to the wind direction. At an upwind finish, the favoured end is the one on the lower ladder rung (since you are climbing up the ladder and you�ll get to this one first). At a downwind finish, the favoured end is on the higher ladder rung. One way to determine the favoured end of the finishing line is to look at the angle of boats as they cross the line. Unless the line is square, one tack (port or starboard) will be more perpendicular to the line. At an upwind finish, you should finish at the end that is on your leeward side when you are sailing the more perpendicular tack. In this photo, for example, you can see the scow #2180 is sailing almost straight across the line on port tack, so the near end is favoured by a lot. There are a couple of corollaries to this rule of thumb. First, if one tack is more perpendicular to the line, the other tack is more parallel to it. Avoid sailing on this parallel tack any longer than needed to get to the line. Second, at a downwind finish, the favoured end is the one on your windward side when you are sailing the more perpendicular jibe. � Watch where other boats go. This is a very good guide but, of course, it won�t work unless you have another fleet, or some boats from your own fleet, ahead of you. Keep a close eye on where these boats finish. If almost every one goes to the pin, for example, there�s a good chance that end is favoured. Pay special attention to where the better sailors finish and which end is chosen by boats that finish very close together. � Remember the starting line. Sometimes the race committee leaves the starting line untouched and uses it for the finish line. This makes your job a little easier. If you are finishing downwind, go to the end that was favoured at the start. For an upwind finish, head for the end that wasn�t favoured. Of course, you must consider wind shifts that have occurred since the start and the possibility that the RC may have moved the line when you weren�t looking! � Check out the finish line during the race. Often the race committee sets the finish line while you are in the middle of your race. If you happen to sail by the finish on a different leg, take a good look. Which end looks better? If you have a hard time judging the favoured end of a finish line, think of it as a starting line. Often it�s easier to figure out the favoured end for starting - then use that info for finishing. 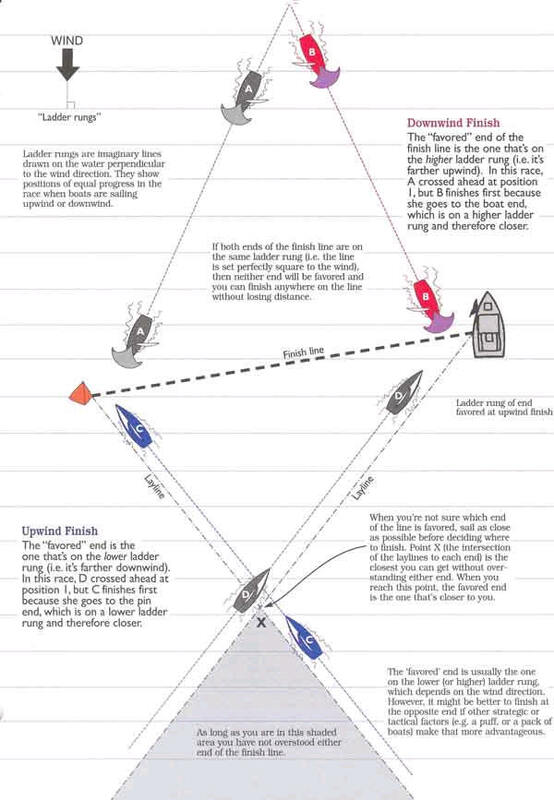 Another method I use is to look for the tack (port or starboard) that is more perpendicular to the finish line. If boats sail more directly across the line on starboard tack, for example, then the port end of the line is favoured, and vice versa. � Wait until you are closer. If you can�t use any of the above techniques, don�t make a decision about the favoured end until you get a better look at the finish line. You can postpone this decision as long as you don�t overstand either end of the finish line (you�re OK if you stay in the shaded area on the next page). If you go past the layline to either end and that end turns out to be favoured, you�ll lose distance. Your last chance to make a decision is when you get to the intersection of both laylines (X). At this point, the end that is closer to you is also favoured, so keep going or tack toward that end. 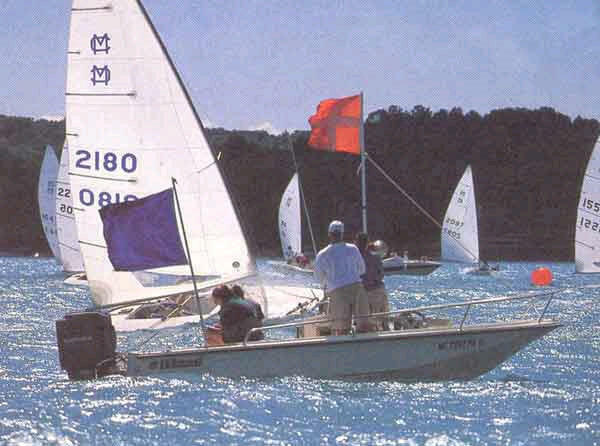 This technique works with finishes that are downwind as well as upwind.